"Instilling values in young people and preparing them to make moral and ethical choices throughout their lifetime is the mission of the Boy Scouts of America. 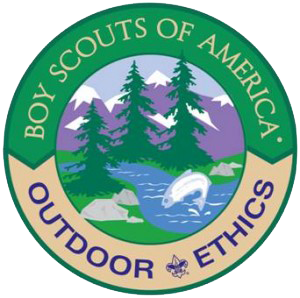 Outdoor ethics (including Leave No Trace, TREAD Lightly!, the Outdoor Code and the Land Ethic) helps reinforce that mission, and reminds us to respect the rights of other users of the outdoors as well as future generations." The Leave No Trace Seven Principles are the bedrock of the Leave No Trace program. They provide guidance to enjoy our natural world in a sustainable way that avoids human-created impacts. The principles have been adapted so they can be applied in your backyard or your backcountry. Conservation and the Boy Scouts of America have been partners for a long time. Camping, hiking, and respect for the outdoors are a part of the Scouting heritage. Many of the requirements for advancement from Tenderfoot through Eagle Scout rank call for an increasing awareness and understanding of the natural sciences. Many former Scouts have become leaders in conserving our environment and protecting it from abuse. Right now Scouts are involved in learning about environmental problems and actively working to make a difference. This awards program was created to recognize those that have made significant contributions to conservation. It was begun in 1914 by Dr. William T. Hornaday, director of the New York Zoological Park and founder of the National Zoo in Washington, D.C. Dr. Hornaday was an active and outspoken champion of natural resource conservation and a leader in saving the American bison from extinction. He named the award the Wildlife Protection Medal. Its purpose was to challenge Americans to work constructively for wildlife conservation and habitat protection. After his death in 1937, the award was renamed in Dr. Hornaday’s honor and became a Boy Scouts of America award.